Hillel gifted us with this idea of creating a space within a space after he started busting out moves at a club. Inspired by the idea of carving an unusual space within a space, Dan gathered a group of Storyluckers to meet for a book club. I got us some donuts to share. Sure, there is No Smoking, Littering, Eating, or Gambling on the train. But there’s always food at a book club. Printed across twenty-some sheets of printer paper our material was “The Four Fists” by F. Scott Fitzgerald. 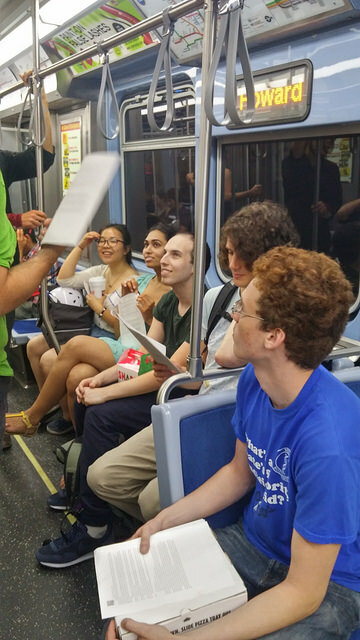 We passed the story out to our participants: myself, Dan, McKenzie, Hillel, and the rest of the Storyluckers that had responded to Dan’s book club bat signal, but also Belmont platform commuters chatting together in groups, CPS teachers on break, fathers calling their daughters, and the other red-liners swaying back and forth with us to the discussion of conflicts and epiphanies. The two-breath summary of the short story, which we would rapid-repeat at each stop, follows a four-fold retelling of Samuel Meredith’s life from boyhood. Each episode follows Samuel getting the wind knocked out of him. Each time, he comes to the realization that he deserved it. We don’t really discuss literary points, landing more on broader themes. In one of my recent classes, I overheard my instructor explain the sport: “Boxing is about touching without being touched.” I instantly related to the idea. In a fight, the entire premise relies upon not being hit. Yet in all probability, you will for certain get hit. It’s a mental paradox you have to put aside while in the ring. In many ways, the way I think about interactions outside of the ring reflects that idea. I want to move through the world without having to adjust my course for other people. I want to emotionally invest in people without becoming emotionally vulnerable. This is not how it works. We cannot live untangled lives. We cannot touch without being touched. Living with other people is in some way guaranteed brain damage. “I used to get in fights with my siblings…” said the girl across from me. I agreed – recalling the memory of having fistfuls of my little brother’s hair in my hand, the painful departure of scalp from skull as he grabbed mine. I suddenly became very conscious of Hillel and his own brother on the train, after I assented. I recall that there had been family trauma, old wounds that were probably still fresh. The train continued to rattle forward towards Howard. I offered a donut to my neighbors. As we got off the train, I realized why they’d refused our friendly advances. I spent the next week thinking over the things we had talked about on the train. This lead to a surprising number of unsettling armchair epiphanies on my childhood. Breaking boundaries, violently or otherwise, can be a scary action. Maybe trepidation regarding personal revelations was why so many of our fellow train commuters had declined our invitation to step from outside their ring and into ours. Perhaps they figured they were better off staying safe within their personal boundaries.